Hoppe cremonese window handle Acapulco series. You need the mechanism to install it. Mechanisms available here. 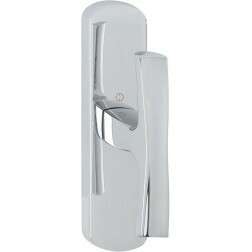 The hoppe cremonese window handle Acapulco series is robust, thanks to solid brass construction. The design is linear and lightly undulating on the handgrip. All finishes for this model are covered with a special treatment called Resista, that protects the finishing for 10 years.